Love the benchtop - could you tell me what it is? If you live in Western Australia Bathroom Warehouse has a massive amount of freestanding baths ,with many different styles and sizes . You'll defiantly find one to suit. The mirror also doubles as a medicine cabinet, it is a custom piece. No-one’s favourite job is ridding a bathroom of mould and mildew. Save yourself some work and maximise airflow through wide-opening windows or louvres like these. The quicker a bathroom can dry out after use, the better. Frosted louvres is another clever solution. The first window is frosted up to head height, for where you need it most, while the remaining two panels feature frosted glass louvres, allowing you quite a lot of control over just how much sunlight (and visibility) you allow through. 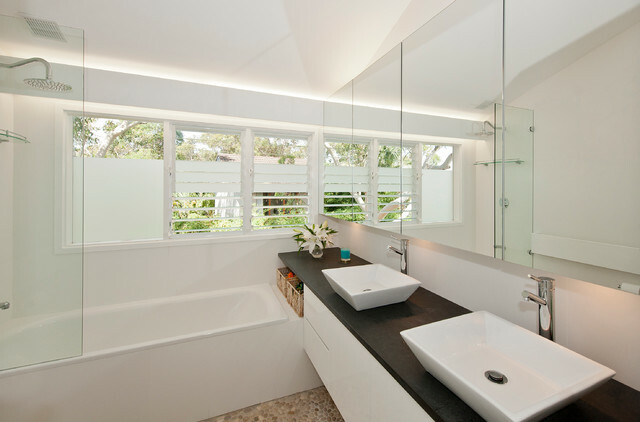 Make more spaceGain extra bench space by running your vanity benchtop over the end of the bath. The space below can be used to store your beauty products in a pretty basket or the kids’ bath toys.